My sincere thanks to the students of Ambedkar Students Association-HCU who are continuously taking up the Rohith movement forward and also to other progressive organisations like Muslim Students Federation, Students Islamic Organisation of India, Dalit Students’ Union and others, My revolutionary greetings! My heartfelt salute to all the teachers and professors who stood as a backbone in this movement. My Jai Bheem to all who are across the nation taking this movement forward and to many of the public organisations, political parties, Ambedkar students organisations and to progressive students organisations among all universities and to all students. And my blue salute and red salute to all the fellow speakers who are sharing the dais with me here. I heard indirectly from you all about the sufferings that Rohith had went through. To get justice for that pain my son had to go through, I have involved myself in the movement over the last three years and now I understand how deep Rohith’s suffering is. The only reason for Rohith suffering is CASTE! The caste practicing Vice Chancellor Podile Appa Rao and the ruling government that is supporting him is responsible for this suffering. The central ruling party instead of following constitution follows Manusmriti as their main motto and this is the main cause. I have understood who is the real enemy of Rohith, in these three years of my struggle. From the above said reasons I have understood that we are living in the times where caste is being re-established in all the systems, created by Manu, through which we are governed and persecuted. The more I understand this, more is my desire to continue participating in all the movements across the nation with all the strength I have. I was highly distressed over the disappearance Najeeb Ahmed, who is also a research scholar like Rohith. The reason behind his disappearance are the Hindu communal forces. By Knowing this I have decided to fight with a conscious determination against the Hindu communal and anti constitutional forces. This same force is also responsible for the death of Rohith. Though there were nationwide movements against them, these communal forces didn’t change instead, the same forces are responsible for the disappearance of Najeeb and his whereabouts are not known to anyone. But these brutal acts to not threaten me or deter me from moving forward, instead I want to fight back! Not only Najeeb, in Una , the Hindutva forces in the name of Gowu (cow) had attacked the scheduled castes in a very violent way which turned me to fight against the Hindu communal forces. That’s the reason I have supported the movement against the violence that happened across the nation and stood up to fight against it. The same Hinduvta and anti constitutional forces had brutally murdered, journalist Gouri Lankesh, I have participated in the movement against this atrocity too.. Jisha’s murder in Kerala, Delta Meghwal’s murder in Rajasthan, Asfia’s killing in Kashmir murder, Pranay’s in Telangana, murder of Manthani Madhukar and many more such killings are being led by the Hindutva anti-constitutional forces and I have participated in every movement and expressed my dissent. I don’t know whether the political leaders who won the elections would fight like me on every issue, but I work with the intention of fulfilling Rohith’s dream with deepest ambition against the acts committed by the Hinduvta anti-constitutional forces and for the victims who got killed. Throughout the nation these Hindutva and anti constitutional forces are not afraid of the constitutional laws and are resorting to violence to re-establish the caste based society. On one hand, the vice chancellor Podile Appa rao in the similar way is harassing the students who belong to SC,ST, BC and minority communities. In his three years of regime he has been harassing the supporters and sympathisers of Ambedkar Students Association or continuously harassing the professors who stood against his anti student policies. If one checks the record of the students against whom disciplinary action was taken in this university, one can realise that most of them are from SC/ST communities. Imposing ten thousand fine on the two Dalit students for breaking a small lock; continuous harassment on the SC/ST students from their respective departments and not allowing them to complete their PhD; making rules where many Dalits students are forced to discontinue their PhDs; disciplinary actions taken against Prasanth, Munna and five others for asking them to provide the hostel for SC students during vacation time; the disciplinary action against Lingaswamy who strongly refused the act of rejecting the original certificate to two women students from Kerala during their admission; issuing showcase notices and circulars to the SC and ST students in order to suppress their voices; charging false criminal case on the Dilip are all the acts by this Vice chancellor to suppress the voices of students. But there is no disciplinary action taken against the upper caste students who have been flouting institutional norms and very little action was taken against the ABVP student who abused Prof. Lakshminarayana on social media. From all these it is very clear that this vice chancellor has been deliberately targeting the students who belong to the SC/ST communities. This clearly shows his intention of destroying ASA which has been standing in support for the cause of SC/ST students. 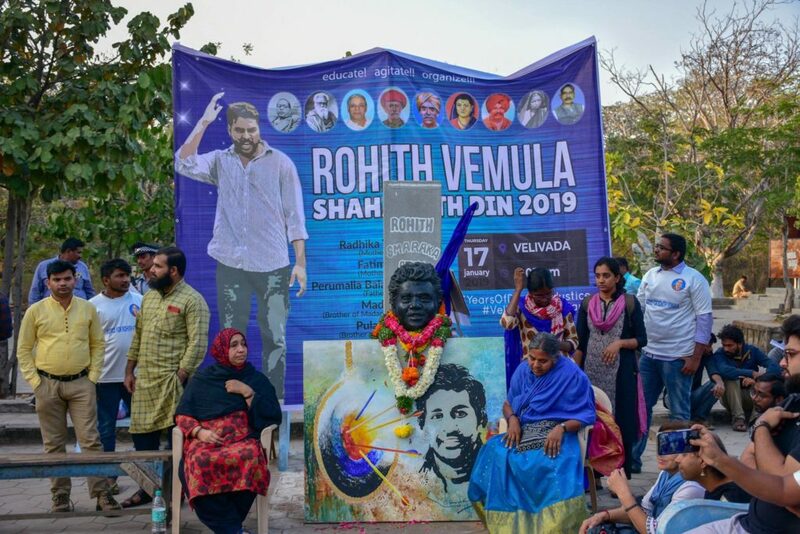 When Rohith was alive, there was a fight against unjust judgement that had been imposed by the vice chancellor, where 5 Dalit scholars who were socially boycotted wanted the world to know their suffering and their democratic struggle. So they built Velivada at the center of the university with portraits of Ambedkar, Periyar, Phule and many more great icons. On 6th of this month the portraits of those great icons were demolished in very insulting and humiliating way by this vice chancellor. He knows that all the students would protest against him for this heinous act. So in-order to escape from this, he had issued notices with false statements and fabricated narrative. Notices were sent to Prasanth, Munna, Samson and Sreeja saying that they had destroyed the university property and false criminal cases were filed. He did this to destroy lives of these students forever. Appa rao Podile is not qualified to continue as Vice Chancellor. With his arrogant attitude he has been continuously harassing students who belong to SC/ST communities. If we won’t confront him and his alleys these atrocities will continue. According to me everything that was written by Rohith in his note is true. There is no difference between the atrocities committed by the Hindutva political forces across the nation and the atrocities committed by the vice chancellor here, at the university. The ruling communal political party is backing him with a great support. He is set free without any bail procedures in the case of Rohith Vemula. No charges were taken by the Police. The Andhra Pradesh government till today has not confirmed the caste certificate and continues to state this as an excuse for not arresting the VC. What kind of justice is this? How is it justified to relate my caste certification with the arrest of VC who is responsible for my son’s death? The police in the case of Rohith, do their inquiry under the guidance of the Hinduvta political party and I can tell you that they are trying to protect all the accused in this case. On one hand there is an intentional delay in the case of Rohith and on the other hand the unity among the public organisations is missing. We have to overcome this and should give a call for serious struggle to seek justice for Rohith. In the Rohith’s case, the accused are trying to approach the court for remand, also, as a matter of fact, the investigation will not been proceed until caste certification is done by the government. And such procedural delays are only in the favour of the accused. 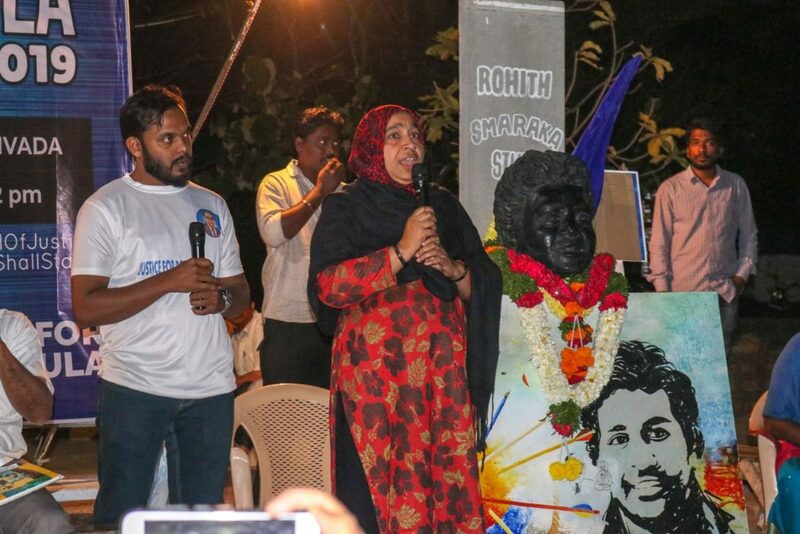 Rohith Vemula’s sacrifice has set a goal to all of us. The goal is to destroy the caste and caste based society. And I hope this will make everyone equal and brings us all together. In fact, Rohith’s sacrifice had let this world know about the atrocities that are being committed by the Hindutva communal and anti constitutional forces. These kind of atrocities are supported by the ruling B.J.P.. We have to create a plan of action and strive for the downfall of B.J.P. For which all the public organisations and political parties should come on one common platform. And I promise that I will stand with you all in this and dedicate myself. Let us fight for the luminary ideology of the Rohith Vemula. We have been fighting for this inside and outside campus and also in Delhi. We are fighting even now, but here, the same VC who is responsible for social boycott of students thereby setting up of Velivada on this campus, has now demolished it in the most atrocious manner. This shows that he is capable of doing anything and wont hesitate in committing atrocities against SC/ST students. Neither will he change, nor will he stop committing these atrocities against us. Even the BJP will not stop its violent acts. Now it is time for us to fight for the removal of Podile Appa Rao as vice chancellor. We have to fight very strong. We all should together decide what to do and how to do. Otherwise we will be unjust to the sacrifices of Rohith Vemula , disappearance of Najeeb, murder of Pranay, Gouri Lankesh and Asifa. If we don’t fight, the violence unleashed by the Hindutva forces at Bhima koregeoan, the atrocities committed on the name of Gow – Rakshak and anti constitutional forces who want to establish the laws of Manu will not receive a fitting reply from us. If we leave it, then this undemocratic caste ruling will continue. If we confront then we can all establish Dr. B.R. Ambedkar’s dream of freedom, equality and fraternity. In the upcoming elections, these Manuvadis want to capture the power and bring drastic changes to the laws of constitution and endanger equality and fraternity. We should all be aware of their intentions and not let Rohith’s sacrifice go in vain. We all together should throw BJP out of the parliament. They are not even eligible to touch the constitution. They are not letting us have our rights provided through the constitution. 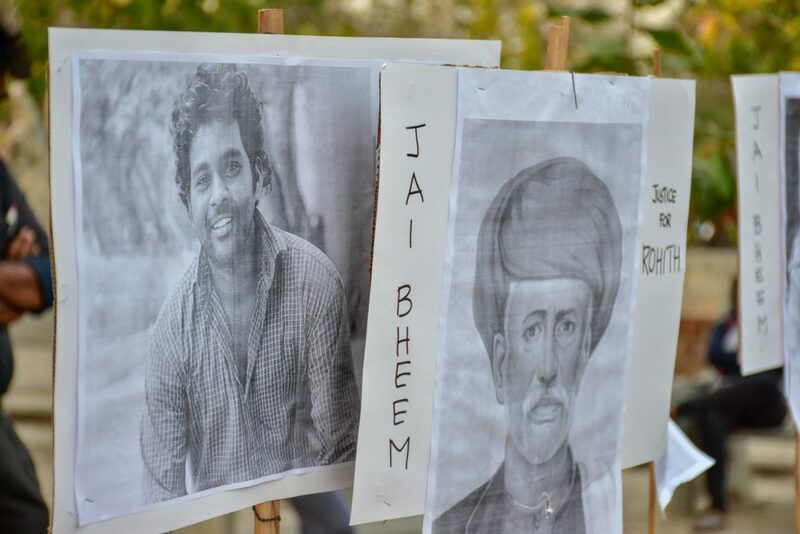 I am moved by the Rohith’s consciousness, sacrifice and struggle. I promise you that I am ready for this struggle against anti-constitutional forces and I will be a terror in their hearts reminding about the crimes they committed against us. I am not going to hesitate to sacrifice myself for this cause. I came to know in this three years that it’s time to denounce all Hindutva communal parliamentary ruling and it is the only way. If not, there would be many more mothers who would be crying for their children, in this BJP ruling, like it is now in the case of Rohith, Najeeb, Pranay and Asifa. The law failed to punish the Hinduvta, anti constitutional forces who are responsible for violence in Bhima koregoean. I also don’t think that the accused will be punished in Una incident and also in Gori Lankesh’s murder. No action is taken against those anti constitutional forces who burnt the constitution. But in Rohith’s case, the leaders of Ambedkar Students Association like Vijay, Seshaih, Prasanth, Munna, Samson, Sreeja, Lingaswamy, Rahul, Kanhayya kumar, Umar khalid, Prof.Ratnam, Thathagat sir, and many more who stood for justice are charged with the criminal cases. We should put an end to this discriminatory ruling. You all should stand forward in this struggle. And I will be with you all in all circumstances. You all decide and give a proper shape to this struggle. I am ready to mould myself according to your wish to take this movement forward. We shall not hold this ruling any more. Our movement doesn’t stop until the vice chancellor is removed from power. With the inspiration of Rohith Vemula let us find a right solution. Let’s change the society. I will be with you all in this journey and I put all my efforts to continue this movement until we achieve JUSTICE…. 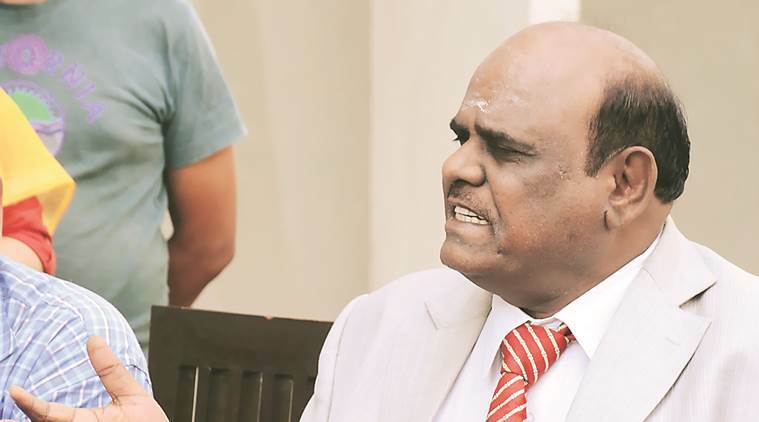 HINDUVTAAND ANTI CONSTITUTIONAL FORCES DOWN DOWN..
Now Justice Karnan has Exposed the Blatant Casteist Character and Rampant Corruption of Judiciary. 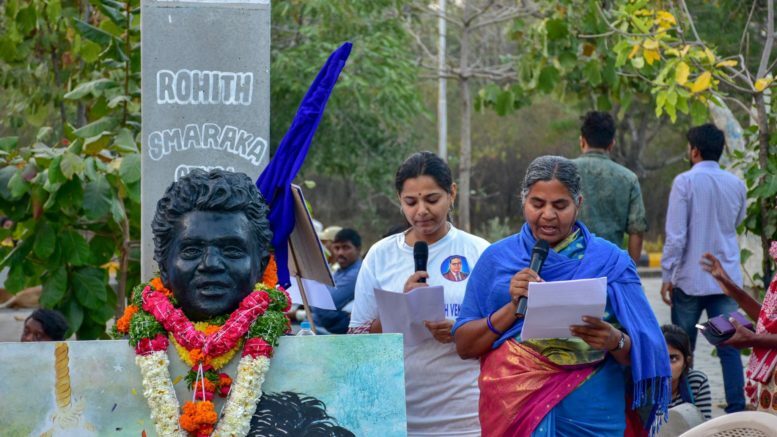 Be the first to comment on "‘The goal is to destroy caste and caste based society,’ Radhika Vemula’s Speech on Rohith Shahadath Din"